Hansu tells me that Tesfai, her brother from Germany is going to Asmara today, and has offered me to go with him. I give 300 Nakfa to Afworki. "But you are my brother", he protests. "But I am your rich brother, and you will need it", I reply. I drink coffee with Tesfai in the Senhit hotel, and at 8:00 we are on our way to Asmara. But the car is giving serious trouble between Keren and Elabered. The engine does not have the strength to climb the mountains, so were return to Keren. I will go by public bus. Half way between Keren and Asmara the 1.5 liter mineral water is finished. I hide the empty bottle in the luggage net, between the bags. But the bus bounces over the road and the bottle escapes after some kilometers and finds the head of an Eritrean man sitting in front of me. He points on his forehead. I will never know if this is the spot where the bottle hit him, or if it is his view on the Dutch tourist. The rest of the passengers cannot suppress their laugh. I share the peanuts (foul) with him and the rest of the passengers. And when I give a demonstration of my knowledge of Tigrinya, we are friends (again). It is a small walk from the Keren bus station to the Adi Quala buses at another bus station. The bus is easily found and I have one of the last seats, so there is hardly any delay. At the checkpoints I show my permit to the Eritrean military police. No further problems. Fortunately, I do not have to leave the bus ( I am in the back of it surrounded by Eritrean women and their luggage). When we enter the Temporary Security Zone, the Indian UN soldiers are not really interested in the bus. Again they do not check the permit. At 15:00 I arrive in Adi Quala. I walk from the bus station, just outside Adi Quala to the Gash Hotel. The only room with a shower is not available. But this is not a problem, because there is no running water anyway at the moment. The toilet does not flush, but they arrange a bucket with water. Problem solved. The personnel is very friendly. Yohannes tells me that I have to visit the Italian mausoleum, a five kilometers walk in the direction of the Ethiopian border. I will do that tomorrow, early in the morning, when the temperature is low. Now I will just follow the main road through Adi Quala in both directions, and some of the alleys crossing it. When I picture a house with an upside down bowl on a stick (meaning that it is a Suwa bar), two Eritrean soldiers appear in the door opening and invite me to try the Suwa, a kind of unfiltered home brew beer. They have told me that the best Suwa comes from Adi Quala, so I ignore all other warnings, not to drink suspicious liquids, and join the military men. When I ask them to picture me, they explain that they are not supposed to make pictures, being part of the military. But when I explain that the only alternative is the old woman, serving the Suwa, they understand. When I am on the streets again, a local police man checks my papers. I show my passport and the travel permit. Everything is ok. It will be the last check of the Adi Quala police, so I assume the police man must have reported it at the local police station. I am very close to the Ethiopian border, so I expected some more checks. On the local covered market I buy a few banana's and some oranges. When I spit out the pits of the oranges, I notice the children are watching me and imitate my spitting. "You, you, what is your name?" "My name is Hannes", I reply to make it easy for them. I ask them their names. At one of the stalls I am invited to drink tea with the merchant. In a small restaurant I find myself something to eat. In the hotel it is still very warm, so I prefer to be on the streets of Adi Quala, even when it is dark. Again I walk the main street and some of the alleys. Children are playing their drums and pose for my camera. "Good night", they say when I resume my walk to the hotel. "Bruch leti", I answer them in Tigrinya. They are exited. Tired of walking I spend the rest of the evening in the hotel, drinking one araki after the other, making my blood useless to potential mosquito's and chat with the owner of the hotel. He tells me that there was a lot of trade before the war. People came from Asmara to buy cheap Ethiopian taff. 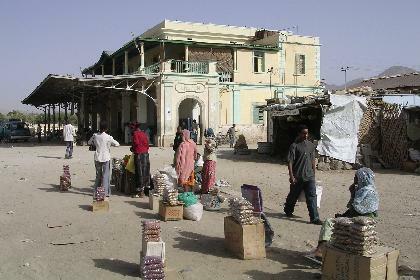 It was a bustling market town, attracting a lot of people, both from Eritrea and Ethiopia. Now there is hardly any trade left. A boy comes to me to bring me my cap, that I left unattended at the bar. 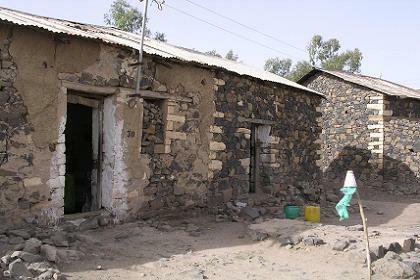 Honesty first, even in Adi Quala. .
Road to Ciuf Ciufit passing Hansu and Afworki's house - Keren Eritrea. Small grocery shop - Keren Eritrea. 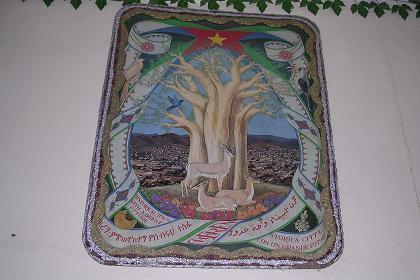 Painting of the shrine of Mariam Dearit in the Senhit Hotel - Keren Eritrea. 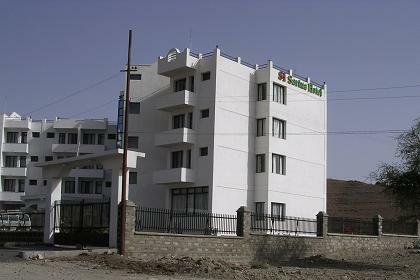 New Sarina Hotel on the road to Asmara - Keren Eritrea. 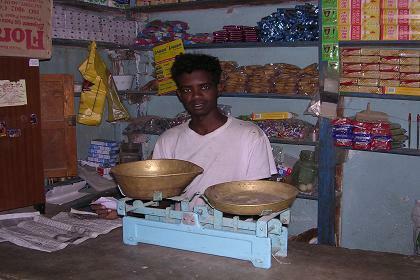 Small scale trade (peanuts or "foul") on the bus station - Keren Eritrea. 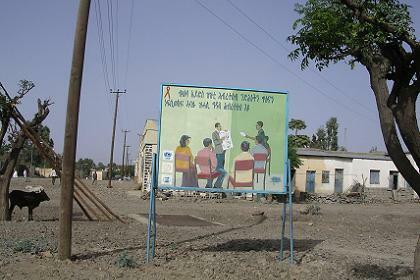 Information on aids prevention - Adi Quala Eritrea. 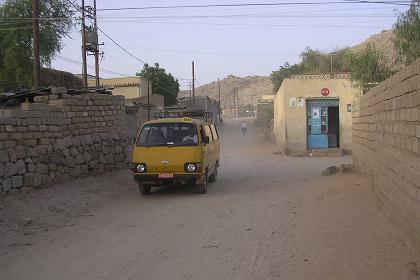 Suwa bar - Adi Quala Eritrea. 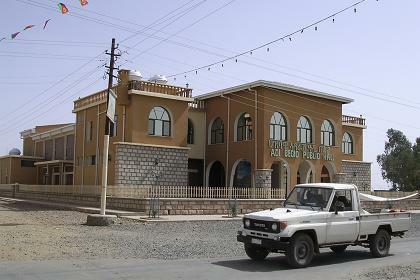 Public hall - Adi Quala Eritrea. 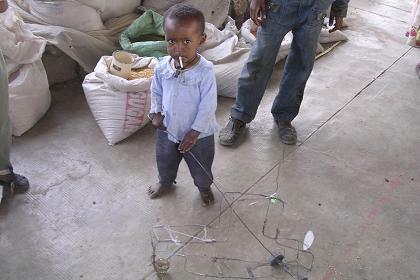 Small boy with iron wire toy - Adi Quala Eritrea. 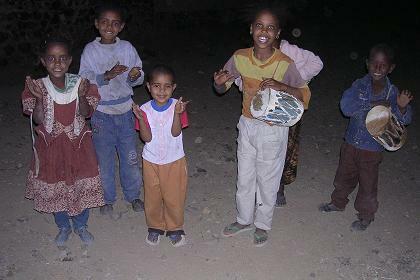 Local kids making music in the evening - Adi Quala Eritrea.